If you have a room that requires both a horizontal and a vertical blind, you might be daunted by how to select treatments that will work together. Luckily, at Window Treats here in New Jersey, we can help you find just the right solution. Speak with a trained specialist today! Hunter Douglas offers an easy and convenient way for you to make fashionable decorating choices: The Whole House Solution™. Basically, Hunter Douglas has taken the guesswork out of selecting the products for your windows by coordinating Hunter Douglas vertical window treatments with their horizontal counterparts. In fact, select fabrics even share the same names and colors. Several product lines offer both horizontal and vertical applications for a more exact match within a room. Vignette® Modern Roman Shades offer the soft folds of a Roman shade and coordinate with the Traversed™ with Vertiglide system. 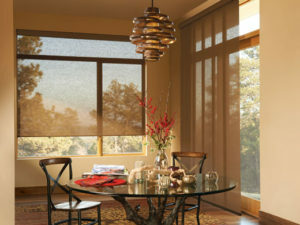 Duette® and Applause® honeycomb shades offer the same fabric in a vertical orientation called Vertiglide™. Provenance® Woven Wood Shades can be made into Vertical Drapery. The vertical Luminette® Privacy Sheers coordinate with Silhouette® Window Shadings and Pirouette® Window Shadings. Designer Roller Shades and Designer Screen Shades share the same fabric as the vertical Skyline® Gliding Window Panels. Modern Precious Metals® coordinate with Somner® Custom Vertical Blinds, for a budget-friendly option. Keep in mind, with each of these products, the textures and lines of the vertical window coverings may differ from their horizontal applications. Also, the outside light will filter into your room differently if the fabric is turned for a vertical window or sliding glass door. However, shutters offer applications that are perfect for both vertical and horizontal openings. They also coordinate with the Hunter Douglas wood and alternative wood blinds. Window Treats, Inc. is service-oriented business specializing in custom shades, blinds and draperies. We serve residential and commercial customers throughout New Jersey including Middletown, Holmdel, Rumson, Colts Neck, Fair Haven, Little Silver, Long Branch, Elberon, Deal, Shrewsbury, Allenhurst, Spring Lake, and Brooklyn NY. Contact us for a consultation!